A music mogul is found dead, and even the detective on the case has a motive: “An excellent police procedural . . . a human and believable cop” (Peter Robinson, author of the Inspector Banks series). When a music producer is found strangled in his apartment, Toronto police detective Barry Gilbert immediately recognizes he is no ordinary victim. Glen Boyd had a prodigious list of enemies, men and women who have any number of reasons to kill him. Even Gilbert himself once wanted to murder the man. From Boyd’s ex-wife to a rock guitarist to a notorious drug kingpin, the victim’s shady business dealings have affected many. But there is one person Gilbert refuses to include on his suspect list, even though evidence keeps piling up against her—Regina, the woman he has been married to for the last twenty years. With outside pressure mounting, Gilbert must embark on a distressing personal journey to find the true culprit behind this crime before his family is torn apart. 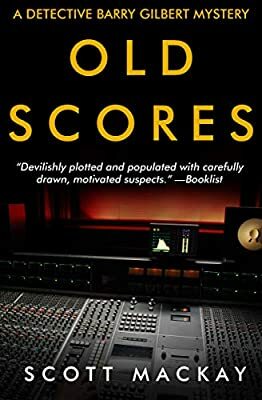 Old Scores is a tense, twist-filled police procedural in the “satisfying series” by the Arthur Ellis Award–nominated author of Cold Comfort and Fall Guy (Library Journal).